I have something to admit. I conducted a poll a while back and then disregarded the results. I feel guilty. I asked for your opinion and you were kind enough to offer it. I hope you know it wasn’t out of apathy. Bob went to see Barber Jen a couple of weeks back but I’d forgotten the camera so Sam prolonged the inevitable. We waited until we had the chance to make Sam’s first haircut the fun event we wanted it to be. Our guy went in looking curly and girly and came out a no-doubt-about-it boy. 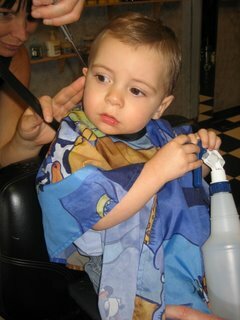 Here he is in the chair as Jen moves swiftly with her magical scissors. Thankfully Sam didn’t notice the Playboys in the old school waiting room. I swear there are big time man laws operating that place even if Jen owns the joint. The patriotic bunch over here spent the 4th watching all American sports on tv. While true sports lovers were anxiously awaiting the big soccer game between Italy and Germany, we couch potatoes tuned into ESPN’s broadcast of the 2006 Nathan’s Hot Dog Eating Contest. Finally, a sport us Americans can win hands down! Or so we thought. The funniest thing about the contest was the commentators who were dead serious describing the action like this was their big audition for Sports Center. They called the contestants “trained athletes” and reminded viewers “don’t try this at home.” We watched in awe and disgust as the contestants focused intently on the matter at hand: chowing pig parts and dunking the buns in carbonated slop so they could shove the whole vile thing into their gullets. By the time the 12 minutes were up, the Japanese victor, Kobayashi, had powered down 50+ hot dogs. Ever the marketeer, I pondered why Nathan’s would sponsor such an event; I can’t be the only one who felt nauseous after watching. Thereafter even the thought of a barbequed Tofu Pup made me queasy. For those of you who read my gastric woes as suspected pregnancy, I am not but there is other happy news. My honey and I celebrated our 6th wedding anniversary on Sunday. A few years older, a couple of hairs grayer but I’m still not feeling that 7 year itch. Thanks Bobby for being mine.